A war crimes tribunal has sentenced the Khmer Rouge's chief jailer for overseeing the deaths of up to 16,000 people, in the first verdict involving a senior member of the "killing fields" regime that devastated a generation of Cambodians. A war crimes tribunal in Cambodia sentenced the Khmer Rouge's chief jailer Monday for overseeing the deaths of up to 16,000 people, in the first verdict involving a senior member of the "killing fields" regime. The man known as the Khmer Rouge's torturer in chief was jailed for war crimes and crimes against humanity. A United Nations-backed tribunal in Cambodia sentenced the man known as Comrade Duch to 35 years in prison. Victims and their relatives burst into tears after hearing that the 35-year sentence given to Kaing Guek Eav had been reduced to just 19 years after taking into account time already served and other factors. That effectively means the 67-year-old could one day walk free. Duch used to be in charge of the prison where thousands were tortured and slaughtered, under Pol Pot's rule in the 1970s. Families of those victims, including Denise Alfonco, said Duch deserves a much stronger punishment. "Why not for life? If you compare all that he did. All the dreadful crimes and torture committed in the S-21 and all the torture they imposed to the population for four years, it's nothing … it's nothing," she said. "What does it mean? Their life is more precious than ours?" The UN-backed tribunal — which took 10 years and cost some $100 million — has sought to find justice for victims of the Khmer Rouge regime that killed an estimated 1.7 million people from starvation, medical neglect, slave-like working conditions and execution between 1975-79. The group's top leader, Pol Pot, died in 1998. Four other senior Khmer Rouge leaders are awaiting trial. Some legal experts said the tribunal may have acted more leniently with Duch, because they were saving the worst punishment for members of the regime's inner clique. 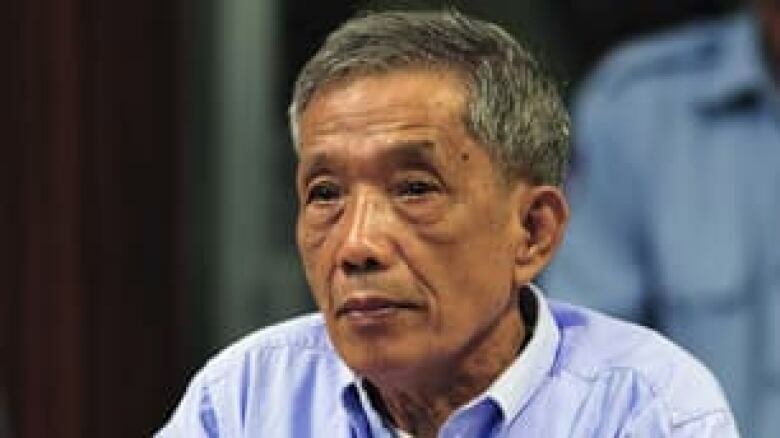 Duch, who headed Tuol Sleng, a secret detention centre for the worst "enemies" of the state, was found guilty of war crimes and crimes against humanity. During the 77-day proceedings, Duch admitted to overseeing the deaths of up to 16,000 people who passed through the prison's gates. Torture used to extract confessions included pulling out prisoners' toenails, administering electric shocks and waterboarding. The court said at least 100 people bled to death in medieval-style medical experiments. During his trial Duch expressed remorse several times and offered to face a public stoning. But just before he was sentenced he asked to be acquitted and released, leaving many wondering whether he's truly sorry for his crimes. "He tricked everybody," said Chum Mey, 79, one of just a few people sent to Tuol Sleng prison — code-named S-21 — who survived. The key witness wiped his eyes. "See ... my tears drop down again. I feel like I was victim during the Khmer Rouge, and now I'm a victim once again." Duch showed no emotion as he listened Monday to the judge talk about the court's findings. When the verdict was read out, Duch stood up and looked straight ahead, his eyes shifting but again showing no emotion. The prosecution and defence have one month to appeal. A former math teacher, Duch joined Pol Pot's movement in 1967. Ten years later, he was the trusted head of its ultimate killing machine, S-21. The government insisted Cambodians be on the panel of judges, opening the door for political interference. It also sought to limit the number of suspects being tried — fearing, some say, it would implicate its own ranks. The prime minister and other current leaders were once low-level members of the Khmer Rouge. More than 1,000 villagers showed up for the verdict, some travelling more than 300 kilometres by bus. "It's just unacceptable to have a man who killed thousands of people serving just 19 years," said Theary Seng, a human rights lawyer who lost both of her parents and has been working with others to find justice. "Now no one is going to have the energy to look at the second case."